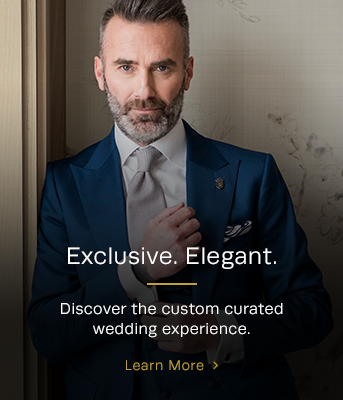 Our Master Clothiers – or Kingsmen as we affectionately call them – are Toronto's most experienced men's style experts, helping you translate your individual look through Custom and Bespoke menswear. When he was a fourteen, Aashif travelled to Florida for a holiday where he found himself facing a shopping decision. Should he buy the track suit worn by Team USA (of 'Miracle on Ice’ fame) or should he buy the Brilliant White Suit that he had seen in Saturday Night Fever? Aashif loves putting on a well fitted garment – it lifts his spirits and puts a spring in his step. And what he enjoys most is when the suits he fits help his clients transform their image and elevate their self esteem and confidence. Aashif's magic will elevate your spirit... and your confidence. If you are in the market for a custom suit, come in with an open mind. The possibilities are endless and you may end up falling in love with a cloth, completely different from what you had in mind walking in. Hozefa’s career in menswear started almost 20 years ago, after an amazing decade at a high-end clothing retailer in India. He dressed some of India’s best known athletes, Bollywood celebrities, socialites, politicians and business leaders. In 2009, Hozefa founded King & Bay with the vision of bringing a brand-new type of exclusive menswear experience to Toronto. His discerning clients love his commitment to both their look and their experience. Hozefa offers King & Bay clients the eye of a master. Craftsmanship is a factor many people have forgotten when it comes to tailoring. While fabric plays a major part, it's important to pay attention to the handwork and construction, as well. Trained in all aspects of tailored clothing by experienced, master clothiers, Michael offers King & Bay clients tremendous product knowledge and a deep understanding of fabrics and luxury labels. After studying in Italy – the world centre of fashion and style Michael spent 8 years at Harry Rosen where he was consistently named to the President’s Club for sales excellence. Michael draws upon all aspects of his experience to find exactly the right look, with precisely the right fit for each of his clients. You’ll love Michael's keen eye For detail & colour coordination. The most exciting part of custom clothing is the creativity aspect. Your style shows everyone who you are without saying a word, so the freedom of choice is key to a personalized wardrobe. Sushant likes the expression 'dress for success.' And, he adds, it works equally well with 'access', 'excess' and even 'noblesse'. Following 5 years with Harry Rosen’s Made to Measure division, Sushant has turned a marketing background, a sociable nature and a love of clothing into a magnificent career as a Master Clothier. Sushant has dressed businessmen, athletes and artists alike – with many clients in the film industry thanks in part to a strong network with wardrobe designers. Want To Stand Out? Sushant makes it easy. Shopping for ready to wear suiting can be incredibly difficult, which is why the custom process is so important. The process allows anyone to get the most ideal fit for them.